Our experienced team looks forward to meeting you and discovering how we can help improve your quality of life. 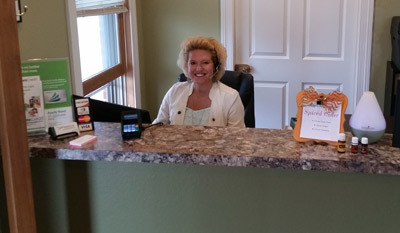 When you arrive at Live Well Chiropractic, Tara at the front desk is ready with a smile and friendly greeting, putting you at ease. We offer you coffee, tea or hot chocolate, making sure that you’re relaxed and ready to begin your healing. Tara will welcome you and put you at ease! We recommend that you download the necessary forms from our website and bring them in with you completed. Otherwise, you can get here 10-15 minutes early to fill them out. 85% of our practice members do not have insurance coverage for chiropractic, or there is a high deductible or their visits are extremely limited. Bottom line, these patients pay out of pocket and enjoy getting the most out of their care without having to worry about third parties regulating or dictating their care. However, if you do have insurance and it is accepted here in the office, we would be happy to verify your coverage, benefits and process those claims for you. You’ll have a brief consultation with Dr. Jeff, going over your history, health goals and challenges. Next, we’ll use the Insight Subluxation Station scanning technology to gain a deeper understanding of any existing problems. An examination is performed, and any X-rays that are needed can be taken on-site. Then, we’ll schedule you for your next appointment. Please plan on being here for about 30 minutes if your paperwork is brought in completed. You’ll sit down with Dr. Jeff for a report of findings, going over the results of your X-rays and scans. We’ll detail all the information you need to know with easy-to-understand explanations that leave you with a deep understanding of your current health and how we plan to improve it. Please plan on spending about 45 minutes with us. On your way out, we’ll get you scheduled for the next couple of weeks’ worth of appointments to make sure you get the times that are convenient for you. You’ll also be informed about our New Patient Orientation course, which you’re welcome to bring a guest to. At this workshop, you’ll learn more about maintaining health, longevity and strategies, exercises and stretches to get the most out of care. It’s held every Wednesday at 6 p.m.
New patient orientations aren’t the only chance you have to learn more about elevating your well-being to the greatest possible level. Dr. Jeff holds other workshops on topics such as The Perfect Storm, ear infections and more. You can also stop by for Patient Appreciation days, where we celebrate the people who entrust their health care needs to our team. It’s important to us that you enjoy your time at Live Well Chiropractic, and we love having fun with our patients! Your entire family can benefit from our natural, highly effective approach to improving your health. Schedule your time today! On-site X-ray facilities are available.